This was one of CNY dish I made. It is very easy, and can be prepared ahead of time other than the last minute finishing cooking which takes about 5 minutes. In a claypot, add 1/2 tbsp cooking oil and toss in stripped onion to coat. Lay clear noodles on top of onion. Set aside. Heat a wok/frying pan and add some cooking oil. Add shrimps and stir fry until the color just change (it’s okay if some parts are still raw). Dish out quickly. Remain the heat. Add a little more oil to the heated wok and saute green onion, ginger, garlic and hot pepper until aromatic but not burned. Dish out and keep the burner on. Pour in all sauce ingredients and cook until it boils. Transfer to a bowl. Arrange half cooked shrimps nicely on top of clear noodles. Drizzle green onion & ginger etc. mixture onto the shrimps. Pour the sauce onto the shrimps, cover with lid and cook on high heat until it boils. Turn heat to medium and cook for another 3 minutes until shrimps are cooked through. Garnish with cilantro. Serve immediately straight from the claypot. I use head on/shell on shrimps for nicer presentation and better flavor. 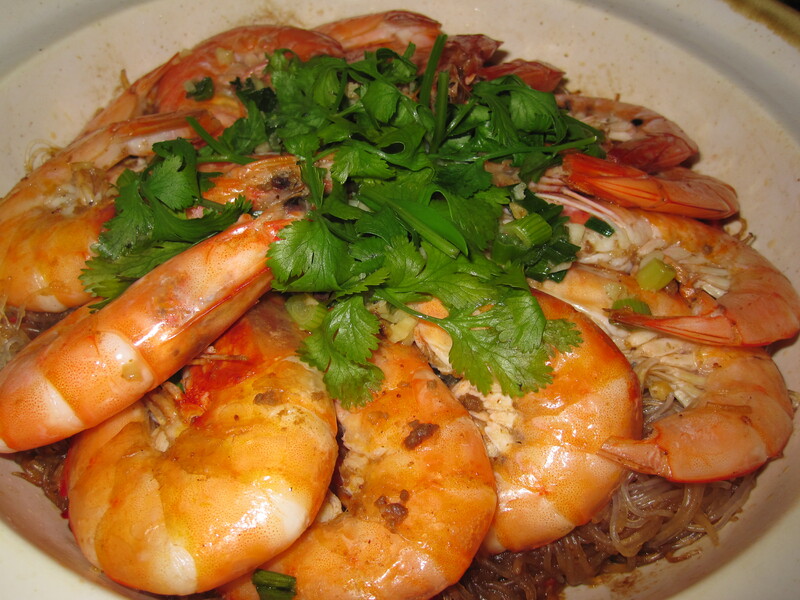 If medium shrimps are used, add the shrimps when the noodles is half way cooked so the shrimps won’t be over cooked. step 1-4 can be prepared ahead of time, step 5 can be done close to serving time.